Oh, that’s good. OK, on with the show! The Patriots have had a significant impact on NFL history. The Patriots have appeared in 8 Super Bowls, winning 4 all in the last 16 years, most recently in a 2014 via a very memorable interception at the end of the game. And lo and behold, guess who is the second youngest QB to ever win a Super Bowl and the man behind center for all those wins? You guessed it, Mr. “Gisele Bundchen” himself, Tom Brady, who won Super Bowl XXXVI at 24 years and 6 months old. 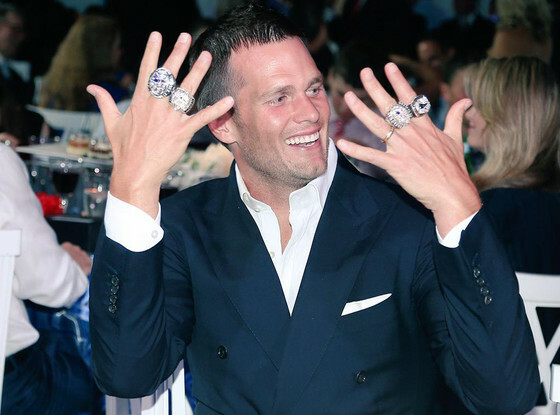 Tom Brady likes Super Bowl Rings. If you think about it, with Super Bowl 51, Brady will have been in 13.7% of ALL Super Bowls. I’m not great with numbers, but that sounds like a lot for one player. Heck, he’s even won a Super Bowl in the very same venue, NRG Stadium, that Super Bowl 51 is taken place. But keep in mind, regardless of how dominant the Patriots have been over Brady’s tenure, they’ve never won OR lost a Super Bowl by more than 4 points with him behind center. Brady had a terrific week against the Steelers in the AFC Conference Championship game, putting up 384 yards and 3 TDs with no INTs, mostly on the back of some big time performances by Julian Edelman and Chris Hogan. Both WRs paced the Patriots in receptions against the Steelers, Edelman with 8 receptions for 118 yards and a TD while Hogan had a career best 9 receptions for 180 yards and 2 TDs. The Steelers had a chance up to the end of the first half, but the Patriots defense held on 1st & Goal from the one foot line, and the Patriots managed to ultimately roll to a 36 to 17 victory. The Falcons, on the other hand, have only been in the Super Bowl once in the past and have never won the Lombardi Trophy. Since their Super Bowl loss, they’ve made the postseason in just seven of 18 seasons. So the Falcons definitely don’t have history on their side. But they didn’t make Super Bowl 51 by mistake. Entering this season, Matt Ryan was 1-4 in postseason games, but so far this season, he’s 2-0 in the postseason and on the fast track to MVP of the regular season with 4,944 yards, 38 touchdowns, and just seven interceptions. And in the NFC Conference Championship game against the Green Bay Packers, Ryan put up 392 yards, 4 passing TDs and 1 rushing TD, with 0 interceptions, only the 4th QB to do that in a conference championship, and ended up with a passer rating of 139.9, which is only his 5th highest passer rating of the season. Julio Jones was a big part of that with 180 yards and 2 TDs on an injured foot, actually only his second best performance in a Conference Championship game as he’s put up 182 yards and 2 TDs the last time around. Plus Mohamed Sanu was his usual consistent self with another playoff TD. 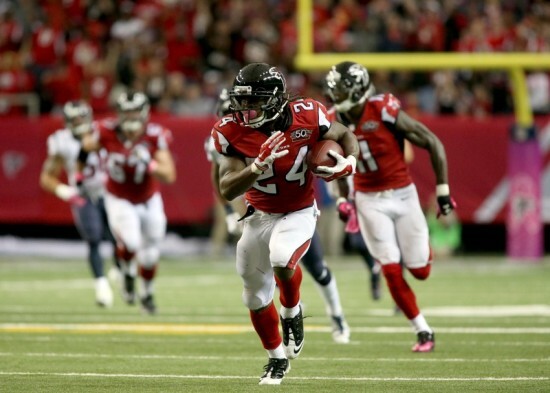 And let’s not forget the backfield tandem of Devonta Freeman and Tevin Coleman picking up TDs of their own. With the Falcons defense taking advantage of mistakes, the much hyped Packers offense never had a chance to keep up. But how will this Falcons high powered offense matchup against the Patriots veteran experience? 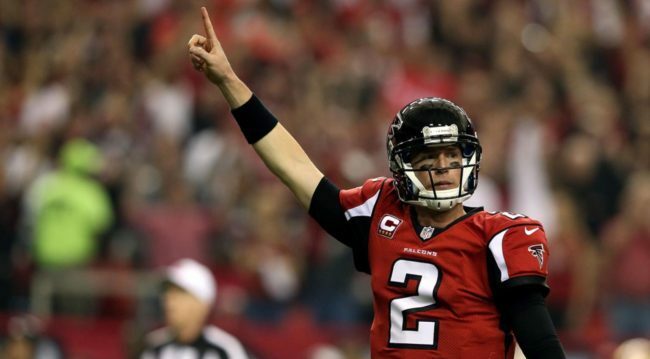 Matt Ryan is having a banner year. And the playoffs have been no exception. Tom Brady & Matt Ryan have been neck and neck in the the MVP race! They have extended their exceptional play throughout the postseason. In reality, this is what we say about Ryan every year until his eventual implosion late in the season. But this year is different. He’s ranked 1st among QBs on Football Outsiders by Defense-adjusted Yards Above Replacement (DYAR) and Defense-adjusted Value Over Average (DVOA) and he has the highest total QBR (83.4) of any QB in the NFL this season. Yes, that’s better than Tom Brady in all three metrics. And now he’s thrown 18 TDs and no interceptions in his last 6 games, with no sign implosion. Part of the reason for Ryan’s gaudy metrics are his gaudy receivers in Julio Jones, Mohamed Sanu and Taylor Gabriel. In fact, Jones is the number 1 ranked WR per DYAR on Football Outsiders with a whopping 1,409 yards and 6 TDs this season. We could go on and on about Jones’ remarkable playmaking ability, Sanu’s consistency moving the chains and providing for a high percentage red zone target, and Gabriel’s game-changing speed and agility, but the bottom line is that they’ve all contributed in a big way to making the Falcons the number 1 ranked passing offense per DVOA on Football Outsiders. The only weakness has been at TE, where Austin Hooper and Levine Toilolo have been dependable, yet uninspiring targets (sorry, but it’s difficult not measure against the great Tony Gonzalez when discussing Falcons TEs, and no one has come close to him yet). And if you flip to the ground game, you have to appreciate the unique one-two punch of Devonta Freeman and Tevin Coleman. Other than being solid all year round, combining for 19 rushing TDs and 5 receiving TDs, essentially sharing touches (although Coleman did miss some time due to injury), both have contributed significantly with TDs in the Divisional Playoffs and the Conference Championship. In fact, they’ve been even more valuable as pass catching backs, with Coleman ranked 1st and Freeman ranked 6th best in the NFL by DVOA. Freeman actually catches 83% of his targets while Coleman catches 78% of his targets, both essentially top 10 numbers at their position. All this adds up to being the 7th best rush offense in the NFL. An important part to all of this is star center Alex Mack. Mack sustained an ankle injury in the Conference Championship, but managed to play out the game. He was limited in practice so far, but seems to be ready to roll. This is going to be incredibly important in light of the fact that Mack posted the best single-season in run blocking for a center over the past four years according to Pro Football Focus. To top it off, the Falcons are tied for the least number of giveaways (11) in the NFL, meaning they rarely turnover the ball, leading to solid +11 turnover ratio during the regular season. Bottom line — the Falcons are loaded on offense. The question is whether the Patriots can slow them down. As I’ve mentioned previously, the Patriots defense has been solid all season long as well. The Patriots only have the 16th ranked total defense per DVOA this season, but they have the 11th ranked weighted defense, which weighs more recent performances above those from earlier in the season to better reflect how the defense is doing at the end of the regular season as opposed to an average over all 16 games. But even looking over the season as a whole, the Patriots have allowed the least amount of points to opponents per game (15.6) in regular season. In fact, the Patriots run defense has been particularly effective, as they ranked 4th in the league per DVOA, have allowed only 6 rushing touchdowns (best in the league) while forcing 8 fumbles on running plays and were one of just three teams to not allow a single 100-yard rusher this season. And during the AFC Conference Championship game, the Patriots held the Steelers to just 54 rush yards on 20 carries, an average of just 2.7 yards per carry. Of course, they’ll now face the combination of Freeman and Coleman, who could be the most dangerous, and highest scoring, backfield committee in the NFL. More problematic for the Patriots will be their 23rd ranked pass defense per DVOA. Worse is that the Patriots are only 20th defending WR1s and 20th defending RB targets, meaning that Julio Jones, who torched Green Bay for 180 yards, and Freeman and Coleman, two of the best catching backs in the NFL, should have plenty of opportunity. It will be interesting to see if Patriots try to shadow Jones with Super Bowl 49 Hero Malcolm Butler. Butler has become one of the best coverage corners in the league, but Jones is darn near uncoverable man-to-man. I doubt the Patriots will be able to contain Jones, but the more important question might be whether they can keep up. The answer, of course, is “probably”. Clearly, Bill Belichick and Tom Brady are one of the most unstoppable duos in NFL history. The Patriots have lost only one game this season with Brady under center, and that was back in Week 10 to the Seahawks. Since then, the Patriots have barely had to sweat, including against the Steelers in the Conference Championship. They have the 1st ranked weighted offense and 2nd ranked total offense per DVOA. They scored the 3rd most points per game (27.6), have the 4th most total yards per game (386.3), got the 5th most total 1st downs (351) and have the 4th highest 3rd down conversion rate (45.8) in the NFL. And regardless of who they have behind center, they’re pass offense has been deadly, ranked 2nd per DVOA this season. If there’s a weakness, it’s their 17th ranked run offense per DVOA. LaGarrette Blount has been incredibly solid pacing all RBs with 18 rushing TDs in the regular season, and Dion Lewis’ return has bolstered the backfield significantly, but the ground game significantly under performed in the Divisional Playoffs. Blount was better in this Conference Championship, but then Lewis dropped off. It’s likely just Belichick’s game planning, but it’s also game planning to your strengths, which does not necessarily include the trio of Blount, Lewis and White. But regardless, the Patriots have highest net yards per drive, which means that for every set of offensive and defensive drives, the Patriots outgain their opponent by an average of 6.66 yards, with 74.2% of offensive drives leading to at least a first down or a touchdown, good for 5th best in the NFL. And the Patriots know how to hold on to the ball as they have the 5th highest average time of possession (31:13). If you look at their games as a whole, they average 44:03 minutes per game in the lead and only trail an average of 8:06 minutes per game. Both are best in the NFL. In other words, the Patriots aren’t used to playing from behind. Plus, the Patriots offense only has 0.046 turnovers per drive, also good for best in the NFL. In fact, they’re tied with the Falcons for the least number of giveaways (11) of any team in the NFL during the regular season and, as compared to takeaways, they have a whopping +12 turnover ratio over the course of the season. And if all that wasn’t intimidating enough, the Patriots are tied for 3rd least total penalties (93) and 4th least number of total offensive penalty yards (819). Said another way, the Patriots are equally good on offense and rarely make mistakes. So what can the Falcons do on defense to neutralize this? The Falcons pass defense has been more solid than they appear, being ranked 19th per DVOA on Football Outsiders, and putting up a solid effort against the always dangerous Aaron Rodgers. They’re also ranked 9th in the NFL defending WR1s and 10th in the NFL defending WR2s. Regardless, the Falcons defense does struggle to defend TEs (giving up the 9th most catches (86) and yards (988) and 6th most TDs (8) to tight ends this season), and 3 and 4 WR sets (ranked 29th). All in all, this means that Edelman and Hogan might not see as many successful targets, but the newly healed Malcolm Mitchell and veteran Danny Amendola may have some additional opportunities, in addition to a semi-healthy Martellus Bennett. Interestingly, according to ESPN’s Bill Barnwell, the Falcons have really dialed up the pressure in the postseason. In fact, their blitz rate went from 16.9% in the regular season to a whopping 36.0% in the postseason. Since we’re all now aware that beating the Patriots means putting effective pressure on Brady (see, e.g., the New York Giants in both Super Bowl XLII and XLVI), it’ll be interesting to see how much pressure the Falcons choose to dial up in Super Bowl 51. In particular, it will interesting to see if they continue to use Vic Beasley on the edge, where he excels, or if they try to slide him inside to follow how other teams have disrupted Brady. The problem is that Brady is among the best at beating pressure with a league best 125.7 passer rating and 90.4 QBR this season against the blitz. 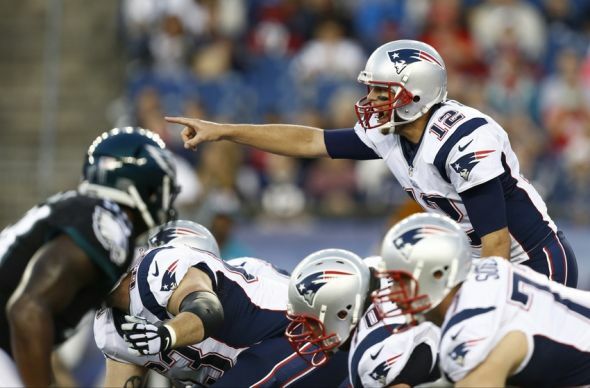 In fact, Brady has thrown for 11 TDs and zero INTs against the blitz this season. Regardless, the Falcons will need to find a way to create inside pressure on Brady like the Texans did in the Divisional Playoffs if they want to have any hope of keeping the Patriots in check. Unfortunately, the Falcons also have the 29th ranked run defense, which allowed 104 rush yards per game and 4.6 yards per carry, good for 4th worst in the NFL. And if there’s something that the Patriots are really good at are scheming week-to-week with their backfield. Belichick knows the Falcons are one of the fastest teams in the league, both on offense and defense, and you can bet he’ll be ready for it. The Falcons will have to play a near flawless game, and provide a solid pass rush, to slow down Tom Brady and the Patriots offense, but slowing them down is likely all they have to do if their offense is firing on all cylinders. Turnovers. Neither team normally commits many turnovers, but just one can be the difference on the big stage. Big Plays. Malcolm Mitchell of the Patriots and Taylor Gabriel of the Falcons both have big play potential. It only takes one to change the outcome of a game. Ball Control. Long drives are the best ways to keep Matt Ryan and Tom Brady off the field. The team that controls the ball longest has the highest chance of success. The Ground Game. Atlanta has one of the best ground games in the NFL facing the Patriots top ground defense. The Patriots, on the other hand, have a mediocre ground game facing a terrible Falcons run defense. Falcons can’t let Blount or Lewis pick up easy yards, and the Patriots can’t allow Freeman and Coleman to score TDs. Pass Rush. The Falcons will need to get some QB hits if they want to get some 3 and outs. Will Experience Matter? 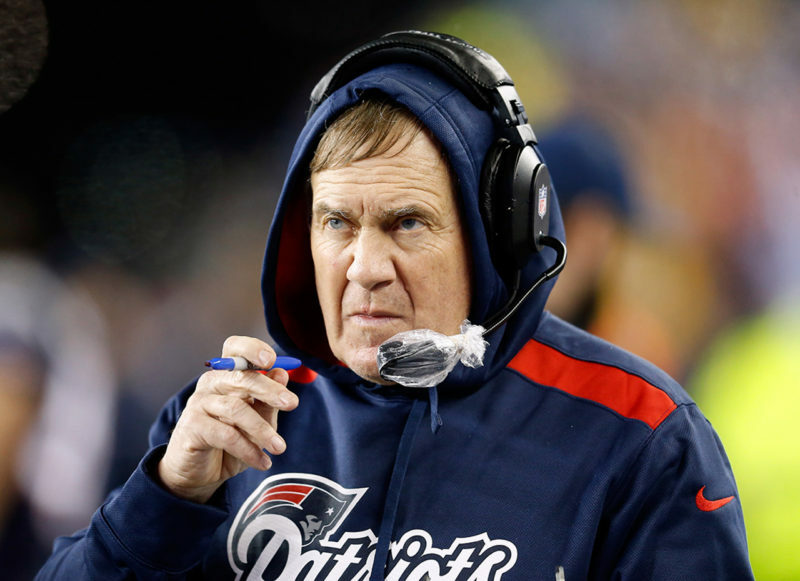 The Patriots, behind Belichick and Brady, have been here before. A LOT. Will the big stage be too much for the newly dominant Falcons? Is Ryan’s yearly implosion coming up in the last game of the year? Or will the Falcons, being the newbies, want it more than the Patriots, like the Giants have shown in past Super Bowls? It’s essentially a pick ’em, but I think the Falcons offense is simply unstoppable, and although the Patriots keep up, at the end, the Falcons pull off a narrow one score victory for their first Lombardi Trophy. Oh, and I predict that Tom Brady will still be pretty and pushy, plus will never track down the dastardly fiend who stole his nickels from his locker. If you’re wondering what I’m talking about, shame on you for skipping the NFL bad lip reading video!